If the saying is true, that we are what we eat, it’d be fair to say most Americans are walking columns of corn, soy, and wheat. These three crops are grown in abundance for many reasons. Most people consume manufactured forms of these foods, like wheat-based cereals and breads, soy-based emulsifiers and oils, and corn-based … well, pretty much everything from sweeteners to thickeners. Animal feed is also supplemented with these crops, so when we’re eating the animals, we’re essentially eating more corn, soy, and wheat. And then there are hundreds of other reasons why these items are mass-produced. We produce fuel, plastics, paints, pharmaceutical excipients, candles, etc. from food crops. This probably doesn’t come as a surprise to very many people. From a Wild Foodism standpoint, however, these foods aren’t too exciting nor promising. As a resident of North America (Pittsburgh, Pennsylvania to be exact), I am far more interested in the foods that the Natives utilized as treasured resources, rather than the foods that make the most profit. This is valuable information for anyone attracted to Wild Foodism. Believe it or not, there are indeed certain species that once possessed more utility than someone today might imagine. These plants were incorporated into cultures as drugs (medicine), food, fiber, dyes, and other things (incense, talismans, toys, fragrances, tools, etc.). 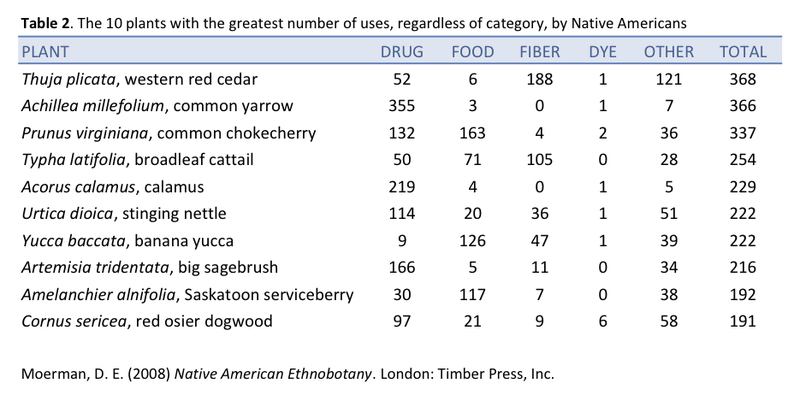 I have included two charts, similar to the one above, examining the most utilized plants in Native American culture. Both tables are taken from Daniel E. Moerman’s tome, Native American Ethnobotany (2008). The first table outlines the 10 plants with the greatest number of uses, and with uses in all five categories (click to enlarge). The second table outlines the 10 plants with the greatest number of uses, regardless of category (click to enlarge). It’s important to note that not all of these plants grow throughout North America. 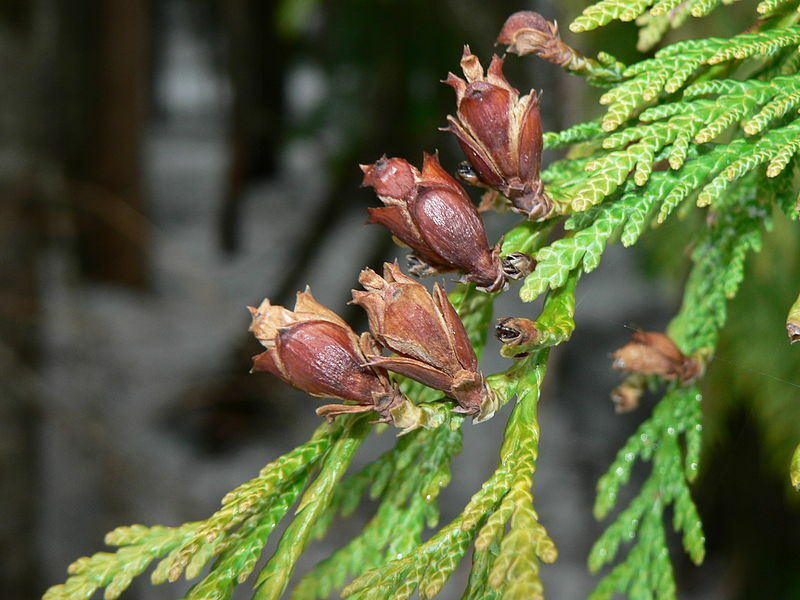 Western red cedar, for example, is primarily found in the Pacific Northwest. Stinging nettle, on the other hand, grows throughout most of the United States and Canada. If you are not familiar with these organisms, I encourage you to seek out more information regarding their uses. There are reasons (very good reasons!) the Natives chose these particular plants to be their allies in everything from medicine to food. Sure, Triticum aestivum (common wheat) may serve a purpose in your life. If nothing else, it’s pretty neat to watch bread rise with the help of yeast. But never forget: dietary diversity is crucial for robust health, and consuming an agricultural diet of corn, soy, and wheat in their various adulterations may not be the greatest health strategy long-term. What is a great strategy, however, is to include more wild foods into your lifestyle. What can you do right now? Take a look at the latter tables above and see which plants inhabit your ecosystem . Research their traditional uses and begin to incorporate them into your life. And ask yourself, from what building blocks do you want your body to be built? The genetically modified, chemically-laden inferior foods of agriculture, or the wild and hearty organisms of the natural world?